Therefore now they are no longer two, but one flesh. Most people who own cactus plants are familiar with what is known as a grafted cactus. Botanists are able to take two very different species of cactus and join them together. The resulting plant, though it would never occur in nature, is often very beautiful. How is this unnatural union accomplished? The botanist causes a wound in each of the two individual cacti, and it is precisely at the point where the two plants are wounded that the juncture is affected. As the two plants heal, they knit together, sharing each other’s very cells, until their union is permanent and complete. It seems to me that a grafted cactus plant very nicely symbolizes what takes place in marriage. Marriage, of course, is the union of two very different individuals. In addition, just as the two parts of a grafted cactus are joined together in mutual woundedness, so there is nothing like shared sorrow and pain for knitting a couple together in love. Joy certainly plays its part in cementing a marital relationship, but a couple who safely weathers the storms of sorrow and tribulation are thereby rendered almost inseparable. Sometimes the trials are brought about by external circumstances. At other times, internal tensions and the death throes of the ego are what cause the pain, yet it is through shared suffering that a husband and wife are best grafted together. The moral of all this is that trials and suffering are not a sign that a marriage is on the rocks. On the contrary, they are opportunities for a deeper union and knitting together. Many spouses cut their losses and run when their marriages face difficulties. They should, instead, roll up their sleeves and work. 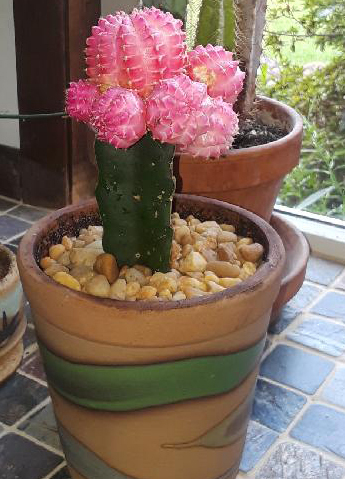 The next time, then, that you are invited to witness the marriage of some young couple, why not give the happy pair a grafted cactus as a wedding present? It will be a great conversation piece in years to come, especially if you explain the meaning behind your gift, and it may remind the couple to be brave and patient when times get tough. Pain, after all, is part of the grafting process. The result may very well be a marriage of unparalleled beauty.